Cambridge English for Scientists develops the communication skills and specialist English language knowledge of science students and professionals, enabling them to communicate more confidently and effectively in their work or study environment. Uniquely, this course focuses on both spoken and written communication, with each of the ten units relating to a case study based on real, published research. This makes the course ideal for scientists from a wide range of scientific backgrounds. Cambridge English for Scientists also develops the learners' language skills with practical reading and writing skills - such as applying for research funding or writing for publications - as well as with speaking and listening skills including 'Describing and Reporting Problems With Experiments' and 'Presenting at a Conference'. 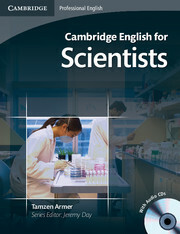 Cambridge English for Scientists requires no specialist knowledge on the part of the teacher and comprehensive teacher's notes are available online. The course is also ideal for self-study. Authentic texts and dialogues situated in the contexts that working scientists and postgraduate and undergraduate science students encounter daily in their work and studies. Emphasis is on the language and skills needed to present scientific information in spoken and written English in a variety of professional situations (e.g. describing data, presenting at a conference, making a written application for funding). Because the focus is on the language skills needed to 'do' science, the course is usable with working scientists and science students from a variety of different scientific disciplines (physics, biology, genetics, etc.). Teacher's notes available online and for free and they are accompanied by extra resources with a focus on developing reading skills for scientific literature. Be My Guest is a language course for pre and in-service students of English in the hotel industry at the elementary to lower intermediate level.